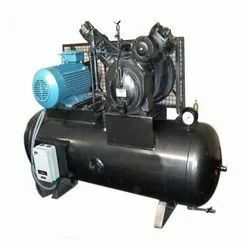 We are a leading Manufacturer of oil lubricated screw compressor, scroll air compressor, oil free air compressor, oil lubricated reciprocating air compressor, oil lubricated screw air compressor 10 hp to 30 hp and water injected oil less air compressor from Pune, India. Well known in the industry for quality and reliability, CompAir continuously develops the L-Series achieving cutting edge performance and efficiency. The L140 range of lubricated screw compressors comprises of fixed speed and regulated speed (RS) models. All models are optionally available with integrated heat recovery. Compressors are more than just a financial investment, they are a key component in ensuring that manufacturers, processors and operators receive consistent, high quality low cost air. The screw compression element is the heart of the compressor and therefore CompAir keeps the design and manufacture in-house, using the latest CNC rotor grinding machinery, coupled with online laser technology. 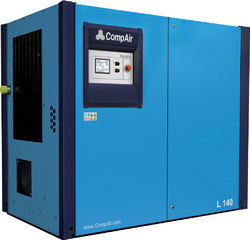 The resulting reliability and performance ensures that operating costs will remain low throughout the compressor's life. The high output airend with slow rotational speed reduces energy costs. In addition to this, the innovative design of the fail safe shaft seal, integrated oil filter and oil regulation valve, ensures external hoses are reduced to a minimum to guarantee that the highest levels of quality and reliability are achieved. Under the free Assure warranty the airends are covered up to 44,000 hours. SD Card – stores several run characteristics. With the ability to display detailed system analysis in the form of trend diagrams and graphs, operating parameters can be precisely set to maximise efficiency. 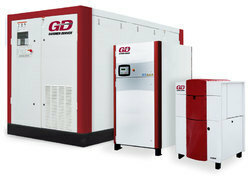 Gardner Denver has launched a completely new range of air-cooled, fixed and variable speed, oil-free screw compressors that utilise 2 stage technology. The new EnviroAire T series compressors range from 75kW to 160kW and are completely 100% oil and silicone free, setting new standards in air purity. ISO 8573-1 Class 0 certified, the EnviroAire T series also offers improved efficiencies and are manufactured to meet the precise requirements of a diverse range of industries, especially suited to those critical applications where air purity is vital. Industries such as 'food & beverages', 'pharmaceuticals' and 'electronics' where even the smallest drop of oil risks product spoilage, production downtime and damage to equipment and brand reputation. The 'automotive' industry too, benefits from a 100% silicone-free compressor, where silicone contamination would cause costly product spoilage through blistering and cracking. “The EnviroAire T/TVS Series with its wide air delivery range and state of the art monitoring, shown and controlled by the GD Pilot TS touch screen controller, is a future-proofed and reliable oil-free compressed air solution for large industry areas”, says Florian Braehler, Product Manager Oilfree at Gardner Denver. Designed and built for continuous use in demanding application areas in up to 45 deg C ambient temperatures, the Enviro Aire T series uses a Gardner Denver designed and manufactured 2 stage air-end that ensures exceptionally low power consumption while providing the highest outputs with absolute reliability and performance efficiency. Electric motors and other components all meet and exceed the highest European and other standards, providing a high quality and premium efficiency. Radial fans are used to minimise noise and reduce power consumption by up to 50% and because all connections within the modern design are on only one side of the compressor, installation is simple. Coupled with a compact size and small footprint, the Enviro Aire T series is small enough to manoeuvre through standard industrial double doors and requires no special foundation. The EnviroAire T series utilises a state-of-the-art touch screen controller - the multilingual "GD Pilot TS" which is extremely user-friendly and provides a clearly structured menu using intuitive visuals. It ensures the reliable operation of the compressor by continuously monitoring operational parameters, essential for reducing running costs. Where multiple compressors are required, the GD Connect 12 management system will intelligently control up to 12 fixed or variable speed units, reducing energy consumption further by adjusting the network pressure to the smallest possible band. For every 1 bar decrease in demand there is a potential for a 6% reduction in energy consumption and as much as 25% decrease in air leakages. The EnviroAire TVS variable speed compressor efficiently and reliably handles varying air demand, slowing down or speeding up to match a fluctuating air demand, so delivering significant energy savings and a consistent air supply. The EnviroAire TVS offers a matched motor, direct drive and air-end ensuring that maximum reliability and the highest efficiency are delivered in any system. The TVS series features an extremely quick and wide response to changes in air demand which in turn leads to reduced wear and tear on components. The EnviroAire TVS compressors offer typical savings of over 20% against a comparable fixed speed compressor, through greatly reduced energy, maintenance and servicing costs. 45/8" & 2½" x 3"
2½" & 2½" x 3"
Fully Integrated Airend: The design of the high efficiency airend operates at low rotational speeds, and as a result lowers energy costs. The innovative integrated design, with oil separation, oil filter, thermostatic bypass valve, reduces the number of external hoses and components resulting in increased reliability. High Efficiency Drive: The L Series range of fixed speed compressors are fitted with a high efficiency IP55 IE2 motor to ensure operational reliability. Small Footprint: Designed to pass through a standard doorway simplifies installation. Low Noise Levels: Reduced installation cost can be achieved by locating the compressor near to personnel or equipment without health and safety issues. High Quality Air: This is achieved by the use of high efficiency air/oil separation system and optimum aftercooling. Up To 46 deg C Ambient: Ensures continous and stress-free operation through efficient heat dissipation. Factory Filled Lubricant: Reduces servicing costs by extending oil change periods to up to 4,000 hours. 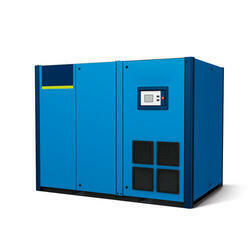 A Range Of Compressed Air Systems To Suit All Applications: Industries, both large and small, rely on CompAir rotary screw compressors for a supply of constantly high quality compressed air. 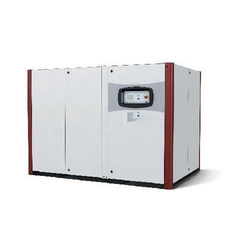 The L Series oil injected rotary screw compressors provide a range that combines high performance, low operating costs and reliability with ease of installation and servicing. Water injected screw compressor so no oil required completely, no oil negates the issues of contaminated air (no risk), single stage single screw airend, direct drive, high quality water injection by reverse osmosis filtration using permeate pump, no gearbox means no oil lubrication, low speed upto 3500 rpm of rotors, compression temperature of upto 60 Deg C and Delcos innovative touch screen controller. 2 years standard warranty and 5 years extended warranty program. Air is drawn through the air intake valve. 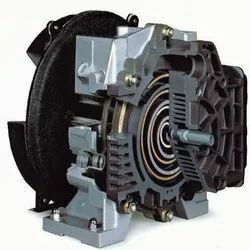 Air is entrapped between the rotor and the stator wall as the cast iron blade is free to slide out of the slot in the rotor. This creates a compression cell. Air is compressed by decreasing volume as the off-set stator enables the blade to return into its slot. Oil is continually injected to cool, seal & lubricate. High pressure air passes into the primary oil separator. Remaining traces of oil are removed in a final separator element, providing high quality air. System air passes through the after cooler, removing most of the condensate. Oil is circulated by internal air pressure. It passes through an air-blast oil cooler and filter before being returned into the compressor without the need for an oil pump. 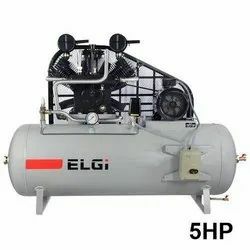 We are offering ELGi Air Compressors to our clients. The two-stage oil-free reciprocating compressors are Elgi's solutions to the increasing need by industries and research institutions for higher purity in compressed air applications. "No oil in the compressor is equal to no oil in output air from the compressor" Elgi oil-free compressors are engineered on this principle. Elgi has adapted a dry crankcase that is totally devoid of oil. 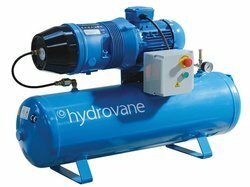 The internal moving and friction parts of the compressor have been designed suitably to overcome the absence of lubricating oil. Sealed bearings have been used for the crankshaft and connecting rods. Poly Tetra Fluoro Ethylene (PTFE) coated pistons and PTFE rings have been used to provide wear resistance. 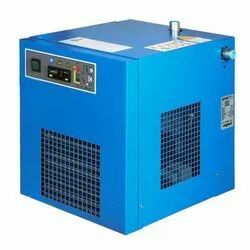 Designed for industrial duty, the compressor is a perfect solution for applications where oil carried in the air can affect the end product or downstream components through which air flows after the compressor. To the customer, this means less expenditure on maintenance elimination of expensive oil removal filters, frequent stoppages for oil top and oil fills in the crankcase. 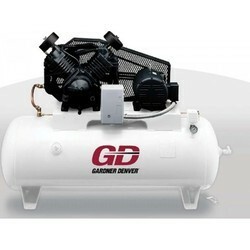 We are offering High Pressure Air Compressor to our clients.